A towering 600-ton statue of Christopher Columbus that has been rejected by New York, Miami, Baltimore and other cities may finally find a home on an uninhabited Puerto Rican island. ­According to media reports, local lawmaker David Bonilla filed a resolution asking the government to study the viability of installing the bronze statue, which is twice the height of the Statue of Liberty without its pedestal, on the island of Desecheo. 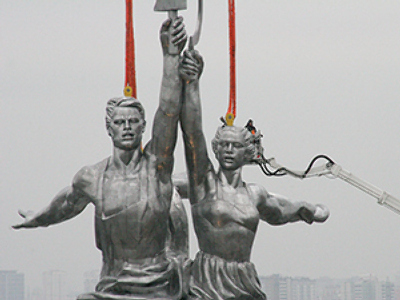 The unassembled monument, known as "Birth of the New World," was first rejected by the US government. 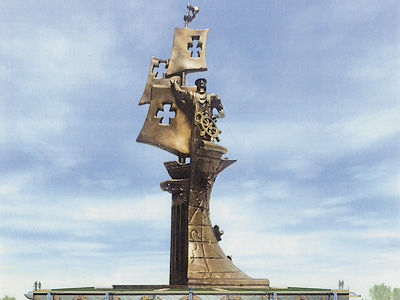 Russian sculptor Zurab Tseretelli attempted to have it installed in the US in 1992 to mark the 500th anniversary of Columbus’ 1492 journey to the Western Hemisphere. It was then accepted by Puerto Rico to be erected in Catano, a seaside suburb of San Juan. But it failed to get any support from local residents. The move called for demolishing several dozen homes, and problems arose with airplane flight paths. The statue was then proposed for Mayaguez. The private contractor in charge of building a series of facilities for the 2010 Central American and Caribbean Games announced that the corporation had bought the structure and would erect it in the municipality, but an appropriate location was never found. It has been in storage in Mayaguez ever since. The statue shows Columbus at the wheel of a tiny ship with three billowing sails behind him. Critics have said the explorer's arms are too long, the head too small and his one-handed greeting pose silly. Bonilla said setting up the statue on Desecheo would help attract more tourists to Puerto Rico's western region. The island is closed to the public, but its waters attract divers. Puerto Rico’s Congress has yet to approve the proposal.